When it was announced in 1960 that judo would make its Olympic debut in 1964 in Tokyo, Ben Nighthorse Campbell knew he had to be there. He had to be there not only to compete in the Olympics, but also to train. Japan was the mecca for judo, a martial art developed by IOC’s first representative from Japan, legendary Jigoro Kano. So after years of training in the United States in high school and college, as well as in the US Air Force in South Korea, Campbell resolved to go to Japan and train at the Japanese judo powerhouse, Meiji University. In the 1960s, there was no organized funding system to train and support American athletes in judo, so Campbell sold his car and his house, and even cashed in his life insurance policy to pay for his trip to Japan. 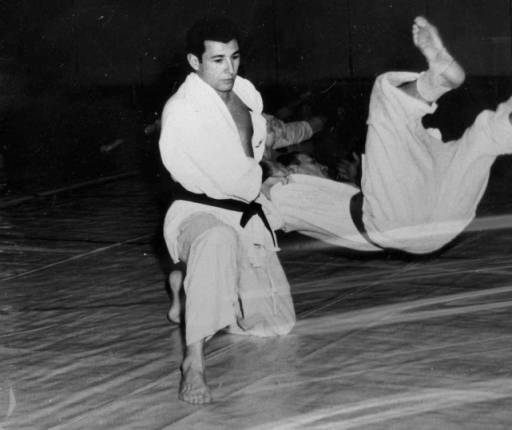 Training with the very best judoka in the world twice a day every day in Japan shaped Campbell into a champion, as he won US national titles from 1961 to 1963, and a gold medal in the open weight division at the Pan American Games in 1963. He also attended the Tokyo International Sports Week, which was held precisely one year prior to the actual start of the 1964 Olympics. This was a dress rehearsal for officials and planners, a way to test out preliminary operational plans, including the opening ceremonies. But it was also a legitimate sports competition for athletes who were invited. Campbell was already in Japan for Tokyo International Sports Week, and pulled off what was considered an upset at the time. He defeated the captain of the Meiji University team, someone who was considered a strong candidate to make the Japan judo team. So when Campbell went to New York City for the Olympic trials, he was at the top of his game. He went on to win seven out of seven matches, five of them on falls, and won a spot on the US Judo Team. With only four months to go before the Tokyo Olympics, Campbell had to stay in shape and stay away from major injury. Unfortunately, he was not in Japan, where the competition was keen. Instead he trained against a large number of inexperienced judoka, which according to Campbell, can be unpredictable, and lead to awkward maneuvers that can lead to injury. As it turned out, Campbell had just such an experience, tearing his anterior cruciate ligament in his right knee. With the Olympics around the corner, Campbell felt he had no choice but to grin and bear the pain. In his first bout in the Budokan during the last days of the Tokyo Olympics, Campbell faced off against Thomas Ong of the Philippines. The match was over in seconds, as Campbell simply rushed Ong and swept his legs out from under him for an ip-pon. His second-round opponent was a far heavier opponent from Germany, Thomas Glahn. And in the midst of battle, Campbell’s knee gave way, and then so did any chance of winning a medal. Campbell forfeited and hobbled off the mat. “If my knee was OK, I could have beaten him,” Campbell told me. Glahn would go on to earn a bronze medal, but could not do better as he lost to Japanese judoka, Akio Kaminaga. As it turns out, Kaminaga was the only Japanese not to win gold when he lost famously to the huge and hugely talented Dutch man, Anton Geesink. And then the Olympic Games ended. It was time to say farewell. Campbell was hanging out with one of his friends from California, Don Schollander. Having won four gold medals at the Tokyo Olympics, the swimming golden boy Schollander was pegged to carry out the American flag for the closing ceremonies. But according to Campbell, Schollander had to leave, literally during the closing ceremony. So somehow, during the march in the stadium, Schollander handed Campbell the flag for the rest of the march. Campbell’s knee was aching. Cold winds were whipping through the late October evening. And the flag and its pole, apparently, is not so light. But according to Campbell in his biography, it was a weight he would bear with pride, not just on that day, but throughout his days of service. Posted in Japan, Judo, Tokyo 1964 and tagged akio kaminaga, An American Warrior, anton geesink, Ben Nighthorse Campbell, budokan, Don Schollander, Jigoro Kano, Judo, Keishicho, Meiji University, Olympic Trials, pan american games, Thomas Glahn, Thomas Ong. Bookmark the permalink.